You might have a reputed beauty parlor business, but you may be missing on lots of clients due to the lack of proper marketing tactics. The fashion & beauty are always been considered a female dominated industry, but now it has grown to a huge level because of the involvement of boys & men also. Promoting & marketing the beauty business among millions & billions of customers is a very tedious task. Email Marketing – an online marketing strategy has taken the front seat today, that not only ensures new customers engagement but also confirms the connection with previous & fresh beauty parlor clients. Easily build attractive email newsletters for any fashion activity. Send those beautiful templates to a huge number of customers & make them aware about brand new beauty services. Without further delay, I introduce to you 3+ best bulk email marketing services for beauty & hair salons. These are quick, responsive & provide a striking edge to the website’s promotion through focused marketing. The sleek email marketing service for beauty cosmetics store offers you to develop email templates by simple drag & drop concept best suiting the business demands. All these emails can be regulated to attract new customers & make most out of your existing network. The different email templates are a perfect medium to draw fresh customers. Use them to promote a brand new range of cosmetics & entice clients to buy these products via catchy & tempting offers. This service also enables you to send an e-template to the customer base & empower them to plan their day or beautiful evenings. Build up a premium beauty shopping destination for the clients using the autoresponder feature of the email marketing tool. Plan a series of pre-scheduled emails that trigger into the inbox of customers as and when decided using the Drip Campaign Functionality. Having a reputed fashion eCommerce website still not getting online customers for your vogue store? Well, this is because you are failing to do marketing of your fashionable store website. A majority of people are not even aware of your fashion store brand, then how would you expect them to buy fashionable clothes & cosmetics products from your site only. So, it’s time to get this premium & exclusive email marketing service that allows sending a bulk of emails to your customers quickly. All those emails will safely reach right to the customer’s inbox, on reading which he’ll land on your site and chances of conversion becomes high. Improve business of your fashion eCommerce site by sending personalized emails. These emails with a personalized touch assure increased email open rates. Increase your email subscribers list by placing an email signup form on different social networks. The email marketing platform completely helps to manage all the subscribers’ data & fashion driven customer’s email ids, which in turn improves your efficiency. In a single click, send bulk emails with attractive templates showcasing the collection & offers of your fashion house. Start building up a brand image by constantly tracking & keeping in touch with patrons on emails. Owners of hair dressing centres & other beauty spas very comfortably create a website for their business venture, but forget to do the website’s promotion. Today, when every small & large business has a website of its own, it becomes very important to stand out of the crowd. Planning to launch a website of your hair styling salon? Give a hand on a premium hair stylist WordPress Theme & promote the various barber services in every corner of the globe. 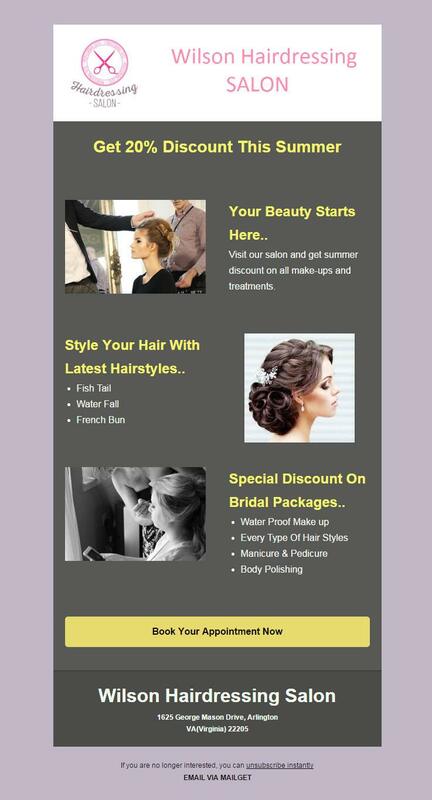 The email marketing service specially crafted for hair & beauty salons helps to engage potential clients as well as convert them into regular customers. With this powerful online marketing tool, hairdressers & hair salon’s owners can build an impressive newsletter, effectual campaigns or a gripping email template presenting all the hair treatments & services along with pictures. The robust tool offers you to manage all the email contacts & prevent your emails from going into spam or junk. This will assist in building up a brand image. The email autoresponder & email tracking feature helps to keep a track of the patrons. Using this aspect, you can check the open rates, click through rates & continuously improve the email service. The majority of customers may be aware that you own a fashion designer outlet, but they might not be knowing about the latest updates & happenings of your business. This email marketing solution, which is specially crafted for fashion designers allows designing the email templates according to the new arrivals & offers in the range of clothes. Have you created a website for your fashion designer showroom? Start your online journey with a responsive Fashion Designer WordPress Theme & take your brand to the doorsteps of your customers. The bulk email sending service allows connecting with a wide orbit of fashion freak crowd. Guaranteed inbox email delivery, which in turn results in high opening & conversion rates. Autoresponder & drip email service regularly update the clients about fashion & vogue trends. Categorize the subscribers into different segments using the List Segmentation feature & keep an eye on the performance of the user. Above is a collection of top email marketing services targeting entire fashion & style salons businesses, that undoubtedly helps to create a powerful impact on the customers. Don’t waste your time in searching for any other marketing option & grab one of the above to give a kickstart to your brand promotion. Aren’t you having a website for your fashion business yet?? Ohh..That means you are losing million of online clients for your fashion business. It’s not too late..you can still win the game and launch a website for your beauty & hair salon business.